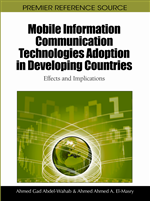 This study focuses on two perspectives from the competition between technologies and the change of market structure in terms of the number of operators in mobile service market. On the promise that the competition between the heterogeneous technologies as well as between the mobile service operators is a core driver of rapid diffusion, a diffusion model that can describe such two types of competition is proposed and further applied to the Korean mobile service case to examine the demand diffusion patterns of service and its characteristics. Through the empirical study on Korean mobile market, we investigate not only the effects on demand diffusion patterns by the competition between technologies and operators, but also strategic implications for the service providers and the policy-makers. Economic growth in such countries as Japan (Jorgenson & Nomura, 2005), Korea (Shin & Park, 2007), and Finland (Jalava & Pohjola, 2007), which are technically advanced in Information and Communications Technology (ICT), is dominated by investments and productivity growth in ICT, both for industries and the economy as a whole. Especially, Korea is well-known for its fast diffusion of mobile subscribers and technological advances in the industry. And thus it is worth understanding the factors that have driven such phenomena in Korea. Mobile communication services in Korea started in the 1960s, which were based on a manual switching system for a division of government agencies in Seoul and a few other areas in the National Capital region. The services became importance in the 1980s as the needs of mobile communications grew rapidly. To respond to such needs, the Korean government established Korea Mobile Communication Services (KMCS) in March 1984. It provided a cellular service, taking the whole responsibility of mobile communications in Korea. The industry structure, however, was changed from monopoly to duopoly when KMCS was privatized (renaming as SK Telecom in 1998), and the Sinsegi Telecom was selected as a new service operator by the government in 1994. Later, in 1996, the government allowed another technology, PCS (Personal Communications Services) to enter the industry to facilitate its competition. As a result, three new operators including KTF, LG Telecom, and Hansol PCS began to provide PCS services. Since then, the two types of services have been fast-growing through active and aggressive marketing and now one cellular and two PCS operators exist after two M&As. Likewise, two factors, ‘the competition between two technologies – inter-technology competition’ and ‘the competition between operators – intra-technology competition’ are regarded as a core driver in the growth of Korean mobile communications industry. Therefore, this study focuses on two perspectives, one concerning the competition between technologies and the other concerning the changes of market structure in terms of the number of service providers in the market, in other words, the competition between operators. And so, this chapter purposes to examine the Korean mobile service market by adopting a diffusion model incorporating the two factors and getting implications from empirical analysis. It is feasible and meaningful to study the Korean case since the growth of the industry is remarkable and the market structure is simple to analyze. Actually, theoretically and empirically diverse studies have been carried out addressing an explosive growth and a great success in the Korean mobile telecommunication (Choi et al., 2001; Kim et al., 2006; Kim & Kim, 2004), but most of them didn’t consider market and technology together, although the combination of two factors could be a main driver for rapid diffusion (Lee et al., 2009; Kim et al., 1999). For the purpose of analysis, a LVC (Lotka-Volterra Competition) model, a famous competitive diffusion model, was adopted and applied to five successive periods, distinguished by an event which caused important changes in market structure such as new entrants, exits, and M&A from Dec. 1993 to Feb. 2003. The research findings are expected to help us investigate the effects of competition on demand diffusion patterns and further to provide strategic implications with mobile service operators and policy-makers in the mobile industry.